The 2018 Millennium Sunday C, D/E & Rec Divisions procedures for submitting weekly lineups and roster restrictions are shown further down on this post. Below are the classification guidelines for 2018 Millennium Sunday Softball League. The "Grandfather" rule no longer exists in Millennium Sunday. 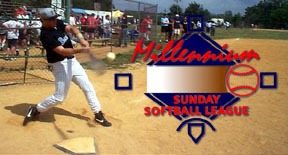 No player classified as "C" in USA Softball of Pennsylvania is allowed to play at any level of Millennium Sunday. - Teams in this division can be made up of players classified as Class E.
- Teams in this division can have a maximum of 3 Class D2 players or a maximum of one Class D1 player and 2 Class D2 players. - Teams in this division can have a maximum of 3 Class D2 players. - Teams in this division can be made up of players classified as Class E ONLY. 1. Lineups MUST be submitted no later then Thursday 12:00 p.m. after each week of play. Note: the will be no exceptions to the above. 2. Prefer email for lineup submission, but text, picture of scorebook is also acceptable. 3. Full names (no nicknames) must be submitted every week and written legibly or there will be no credit for games played. 4. Teams must submit lineups for both their team and the opposing team each week. Other divisions may be collecting lineups from only one team, but for the C, D/E & Rec Divisions, we are requesting lineups of both teams. If the opposing team refuses to give their lineup or does not supply full names, they will not receive credit even if they turn in only their lineups with full names. 5. 8 games needed to be playoff eligible. * Players can only play for one team in the league - no matter the division. * Playoff Rosters are limited to 20 players. First roster submission please indicate any team member who is active duty or in the reserves. The league, and its captains, reserve the right to disqualify or approve any player for playoffs. Use of illegal players will result in immediate forfeit of games played and possible additional consequences from the league. Any questions please reach out to your Division Captain. - Contributions to this post were made by Andy Ruhf and Steve Prescott.